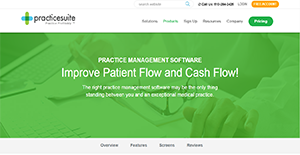 PracticeSuite is a practice management solution that assists medical professionals in improving their patient-related processes and increases their cash flow. With PracticeSuite, users can access their data anywhere and at any time through internet browsers. They can do so with a peace of mind because the application is equipped with advanced security protocols to protect user information. PracticeSuite also provides medical professionals with the tools they need to expand their practice online. The solution comes with online appointment setting, online bill payments, and kiosk services that are beneficial for both the medical service provider and the patient. PracticeSuite is a cloud-based software, which means that medical practitioners and their assigned users can access information stored in the system anytime from anywhere. They can do so while being certain that their practice and patient information are safe since the medical practice solution is protected by high-level security protocols. With PracticeSuite, users and practitioners can avoid the hassle of re-enrolling patients. The software takes care of storing the patient record in the system for easy pull up for the next visits. Medical facilities can increase their patient visits with PracticeSuite. The practice manager is equipped with tools that allow clinics, hospitals, and other medical facilities to reduce no-shows by sending appointment reminders to their expected patients through text or email. Not only can they enhance their profits, they also ensure the health of their patients and increase their satisfaction in the process. Medical facilities can now expand their practice online. That is because PracticeSuite supports online appointment scheduling, email communications, online bill payments, and kiosk services. This makes appointment setting and financial transactions easier and more convenient for patients. PracticeSuite comes with standard and customizable reports that medical practitioners and facilities can generate to better gauge their performance. They can use these insights to boost their operations to better serve their patients and make their services smarter. If you are interested in PracticeSuite it might also be beneficial to check out other subcategories of Best Medical Practice Management Software listed in our base of B2B software reviews. Organizations have diverse wants and requirements and no software platform can be just right in such a situation. It is futile to try to find an ideal off-the-shelf software product that fulfills all your business wants. The wise thing to do would be to modify the system for your unique requirements, employee skill levels, budget, and other factors. For these reasons, do not hurry and subscribe to well-publicized leading applications. Though these may be widely used, they may not be the best fit for your unique requirements. Do your research, check out each short-listed platform in detail, read a few PracticeSuite reviews, contact the maker for explanations, and finally settle for the product that presents what you need. How Much Does PracticeSuite Cost? Custom pricing is available for medical practices and facilities with more than 5,000 claims per month. For more details, contact sales. We realize that when you make a decision to buy Medical Practice Management Software it’s important not only to see how experts evaluate it in their reviews, but also to find out if the real people and companies that buy it are actually satisfied with the product. That’s why we’ve created our behavior-based Customer Satisfaction Algorithm™ that gathers customer reviews, comments and PracticeSuite reviews across a wide range of social media sites. The data is then presented in an easy to digest form showing how many people had positive and negative experience with PracticeSuite. With that information at hand you should be equipped to make an informed buying decision that you won’t regret. What are PracticeSuite pricing details? What integrations are available for PracticeSuite? If you need more information about PracticeSuite or you simply have a question let us know what you need and we’ll forward your request directly to the vendor.